I never experienced a state fair until I left California. Once I began living in the Midwest I became a fan of the fairs; specifically the ag-hort and domestic arts buildings with the polished vegetable specimens, blue ribbon baked goods and crazy-good quilts. And how great to roam around the livestock barns and pick out critters for your fantasy farm. Sunday morning I got the chance to see it from a whole new perspective. My daughter decided that this was the year of the pie. She would be taking her blueberry pie for judgment day at the fair going up against the likes of the tiny but mighty Marjorie Johnson. Look out Marge, there's a new generation of bakers nipping at your heels. If there's nothing else I've taught my daughter, it's the art and power of pie. From the zen of preparing the filling to the deft touch required for fluting a crust and the swoon-inducing results, it is almost a lost craft. Little did I know that she was watching me and now puts out a pie worthy of entering the hallowed halls of the Creative Arts Building where we recently stood in line with a surprisingly un-stereotypical crowd. And this is after your vehicle has been screened by police as you drive into the seemingly deserted grounds. How different to be driving down Dan Patch street instead of hoiking it in the heat with a sweaty lemonade shakeup and that queasy too-many cheese curds sensation. I expected a melange of middle-aged to senior ladies toting their Tupperware containers of cakes and cookies, but instead it was an assortment of Minnesotans arriving in everything from pickup trucks to Range Rovers. Old and young, men and women, even a cute guy in a tie (was it his wares or his wife's, I wonder?) with armloads of pies and cookie plates balancing precariously as they took their place in line. I wandered in and out of line checking out her competition, hmmm, that crust behind us looked lumpy next to my daughter's delicate lattice, but would her blueberry filling show its farmers market provenance? 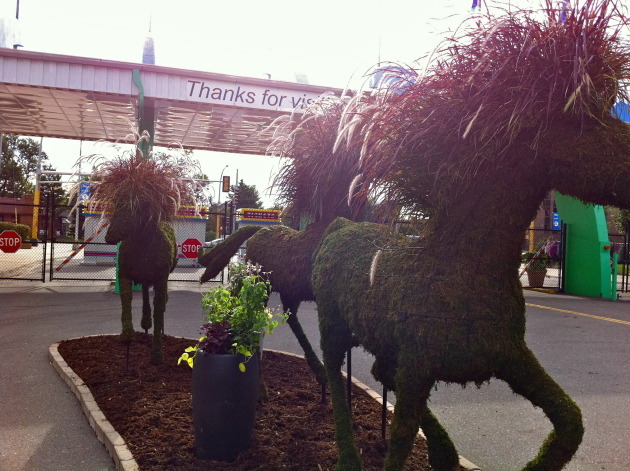 When I went a little nuts over these great topiary stallions at the front entrance, and a sneak preview of these wonderful horse trough planters, she warned that I was going all paparazzi and I needed to get back in the queue. Galloping Grassy Horses! Aren't these the greatest? 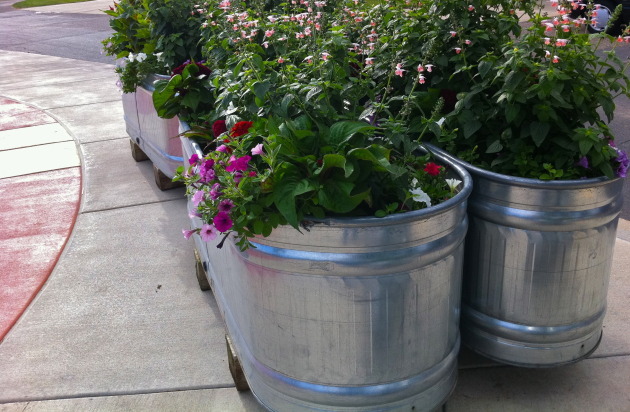 And look at these galvanized gardens! Here's hoping Hannah and her most excellent pie fare well at the fair.